Last edited by Rhino-9-3 on Sun Oct 03, 2010 7:46 pm, edited 3 times in total. Thanks for the update. I never knew that this one was going to be restored to flying condition. Hopefully the city of Windsor will allow them to fly it. If not, it would be cool even if they could do a fast taxi similar to the "Just Jane" Lanc in England. I heard a rumor that they were going to have one of the engines run up at the airshow in August. Anyone know if that's true? Yep thats what they're going to be doing if everything goes as planned. Here are a few pics from last summer so all can have a starting reference point for pics yet to come. Post subject: Lanc to fly? Having worked on this aircraft and seen the damage first hand I would be extremely optomistic that she will become anything but ground running. There is a suvstantial aount of flooring and structure that was cut out and damaged in her Centre section and spars not to mention alot of her engine control sprockets and chains were cut out and removed. Saying that though I wish them best of luck with a difficult and expensive restoration. It is only in the past six months or so that I have heard of an airworthy restoration being possible for FM212. When she was taken down, it was said that her skin had been worn down to kitchen-foil thickness by repeated sandblastings. The implication was that she would need a 100% skin replacement to be airworthy. That, plus the factors Peter mentioned, makes me wonder whether the crew up there is spending too much time in the casino bars, or were rumors of the aircraft's death from exposure found to be exaggerated? I'd love to see it happen, and with enough money I'm sure it could, but I share Peter's scepticism. Mike didn't mention anything about having to completely re-do the skin but next time I'm over there I'll find out. The center section of the plane is being re-built though. They are also trying to aquire a rear turret right now. They're in talks with a guy out west who has 3 but the guy doesn't want to part with any of them. From what Mike was saying they are restoring it to flying condition no matter how much time it takes and how expensive it will be. The other thing they've been working on is replacing the rivets (European to NA) on the access panels all over the plane, most of these rivets have been completely corroded and are very hard to get out. He showed us one of the panels on the stabalizer that had been completed, he said it took about 100 man hours to do that one panel. Also it's taken about 1000 man hours to strip off the paint on the right stabalizer/tail. I'll probably go over there once a month and find out about what has been done and get some new pics of the work so I can keep everyone updated on the restoration. I know Mike very well and he was invited to come down to the park to help out as he said he would be interested. By rivets I think you mean fasteners as all the lanc inspection panels excluding cowlings were attached with slot head screws. The guys on our lanc converted them over to north american for easier maintenence. They do have a website for the lancaster that you can access from CH2a site. I wont put up the link to the site that I have for it as it will be coming down shirtly. Shame as it is a much better site and has run for over 415 weeks! I'm excited to hear rumours of a flyable restoration for the ol' Lanc. What a sight that would be to have two Lancasters roaring overhead! I wish I could go over there to help with the work. I bet there's a lot of stuff that untrained people could do. Like paint stripping, and drilling out fasteners, etc. Good luck to all involved, and thank you for keeping us updated. Oh, and is it just me, or do y'all get the feeling that putting this Lancaster on a stick really ended up saving its life? Sorry about that, he did say they were slot head screws used on the panels. Any idea why the website is coming down, and are they making a new one? That is the site that I built for the Lanc way back in the early days when she only had a couple of people getting together to help when she was on the post. Apparently they have a new site and no longer wish to maintain this one as well. I have to say your site looks a lot better than the new one, too bad they don't want to use it. I'm trying to get involved with the new Lanc site. Right now it doesn't get updated much, so I'd like to try to do a monthly update on it so everyone knows what's going on. 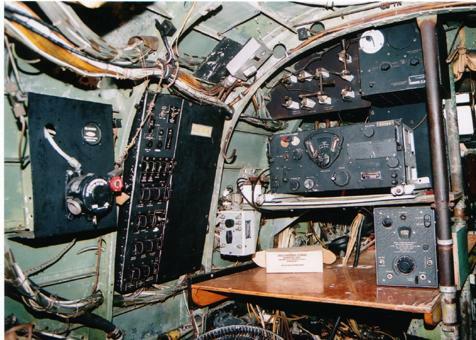 Is this really the interior of the bird? Or is it that of another Lanc? If so, that airplane sure came with a lot of goodies in it when the DND gave it to the city. Or was it added in during a restoration?